He does the little things that no one else is willing to do. Like handing keys over whenever a prodigal son returns, or identifying the body of said prodigal. He’s always believed himself capable of fixing any issue his extended family needs fixed, even those they create for themselves, but when a powerful paladin comes to town and starts killing orcs, Jack may be out of his depth. With the help of Drow detective, a reporter that is more than she seems, and a wizard with plans of his own, Jack hopes to, if not fix the problem, at least make sure it doesn’t get any worse. That’s when the paladin’s angry god shows up with a whole army of holy knights. 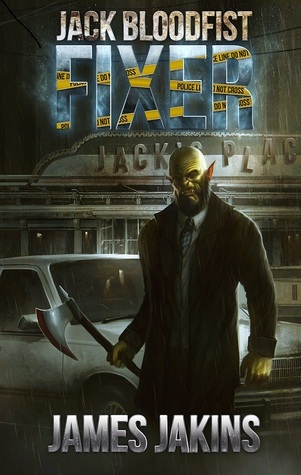 Jack Bloodfist is an urban fantasy/noir crossover (kind of?) that was fairly short but packed one hell of a punch for its few pages. Was it a perfect book? No, but it did tell quite a story in these few pages. Have you ever read a book that just has so much in it you can’t believe it’s not a million pages long? Yeah, it’s like that. Coming in at fewer than 300 pages, Jack Bloodfist is a regular guy, living a regular life. Some powerful Paladin comes to town and starts killing orcs, so he hooks himself up with a reporter who is more than what she seems, and members of his family to figure out who is doing what to his family. It really gets going at a fast clip almost instantly and is absolutely relentless plot-wise. My biggest downside regarding this book is its predictability. I felt like a lot of the plot elements that were supposed to be surprising, I felt coming a mile away. Now, that’s not always a bad thing. Sometimes I like reading a book that tells a hell of a good story, even if it’s predictable. This one kind of fit into that category. Yes, it’s predictable, but it’s also a lot of fun, and I really enjoyed the characters and world building, so I ultimately felt like the predictability was forgivable. Jack Bloodfist, as I said, is pretty fast paced and there’s a lot in these few pages. Sometimes I felt like the book got a little bogged down in itself. Sometimes I felt like it was trying too hard to be clever. Some of the jokes got a little old and worn out, tired, I guess one could say. I also felt like the dialogue felt a bit dry, and sometimes that predictability I mentioned in the plot bled into the characters, making them feel a bit two-dimensional and cookie-cutter. Predictable. There were some plot threads, side plots, that were interesting and could potentially lead somewhere interesting in future books in the series. I did feel like this was very much the first book in a series. It’s self-contained, there is a story here all on its own, this isn’t a book that you can only read if you’re planning to read the next book, for example. If you just want to read this first book, you’re fine doing that. However, I do have a feeling like the next book in the series might be a bit more rewarding. I have a feeling it broadens a bit and plays on some of the more interesting elements that were glossed over a bit here. I could be wrong, though. I haven’t read it yet. There are a lot of interesting creatures in this book, most with their own twists, but they were pretty urban fantasy typical, werewolves, dwarves, wizards, etc. There were some new ones thrown in there as well, but largely I did feel like a lot of these characters have been kind of done before. They were good in the book, but nothing regarding world building that really blew me away. So, Jack Bloodfist was a lot of fun. Predictable. The characters were great but left me wanting. This book did have me laughing quite a bit, and I enjoyed it despite its predictability. It’s short, with a plot that really gets moving pretty quick. This isn’t a book that will win any groundbreaking literary awards, but it is a book that is fun, and it does what it sets out to do really well.